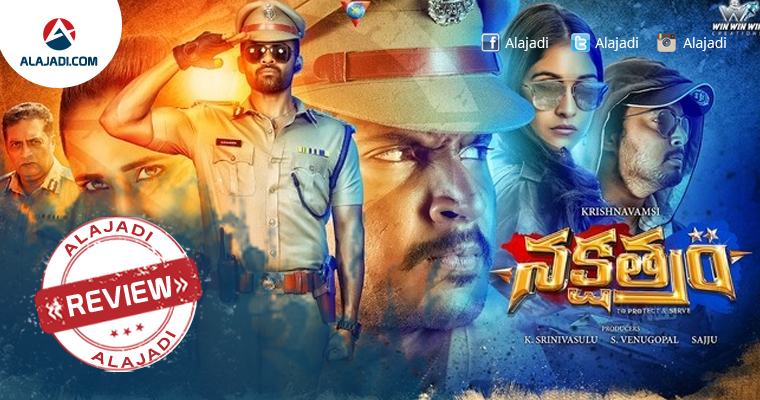 The Most Awaited Film of Creative filmmaker Krishna Vamsi’s much-awaited flick ‘Nakshatram’ is finally released Friday, August 4th, 2017. Notwithstanding the commercial successes at the Box Office, Sundeep Kishan has been picking out-of-the-box scripts. His last film Nagaram (Maanagaram in Tamil) received critical acclaim too. And here comes his next Nakshatram for which Sundeep collaborated with Krishna Vamsi. The film has been projected as his one of the most-anticipated films. As the film hit the screens today, here is our take on the film. Rama Rao (Sundeep Kishan) is an aspiring police officer who has immense passion as well as respect for his profession. He doesn’t spare anyone who disrespects a cop. His father, grandfather were cops too. Sundeep’s mother runs a tea-stall opposite the police station and wants to see her son as Sub-Inspector. Sundeep’s last two attempts in the written test were not fruitful as he is ‘poor’ in English. Rama Rao vows to clear it in the third attempt to fulfill his dreams. What stops Rama Rao in becoming SI? What is the evil force? How does he resolve all the problems and settle down with his love Jamuna Rani (Regina Cassandra)? This is what Nakshatram is all about. Many movies have been made on the police department and most of them have shown it in a negative light. However, now Krishna Vamsi has tried to showcase the strength and positive side of the department in Nakshatram. The director has penned an interesting story and screenplay, which engage and entertain you right from the beginning till the end. This film is worth your hard-earned bucks. Sundeep Kishan steals the show all the way. The performances of the cast rescue the film. Sundeep, Sai Dharam Tej, Regina and Pragya have all done their parts well. Prakash Raj is the saving grace for the film. His lecture on how cops are walking stars (Nakshatrams) on earth is touching, inspiring. All the other actors did their best in the limited roles they got and impressed the audiences. Technically, the film is good but there are not many elements which will make us tell that the film is outstanding. Sreekanth Naroj’s camera work is good. But there is some problem with the colouring and DI. The director tried his best to present the frames in a beautiful manner. The editing by Siva Y Prasad is okay in the film. The transition of the scenes is good. There are still few ups and downs in the flow. Three Music Directors Bheems Ceciroleo, Bharat Madhusudhan and Hari Gowra worked on the project. The music failed to impress and the BGM is just okay. The art work is good. The production values of the film are rich.